Well, believe it or not, there have been headphones that use different types of connections for quite some time already. No we’re not talking about crappy Bluetooth. We’re talking about headphones that have USB cables and Lightning cables instead of 3.5mm jacks. Indeed, many companies have seen the benefits of using a powered audio cable, one feature of which is the ability to integrate a DAC/amplifier directly into the cable/headphones themselves to produce higher quality audio. Once company that has been doing this since 2014, yes, 2014, is the one and only audio-meca Sony. Leave it to a pioneer like Sony to have been making headphones with integrated DAC/amplifiers as early as 2014, long before anyone suspected smartphones would be dropping their traditional headphone jacks. Thank you Sony for prophesying the future and making a product audiophiles can use with their new iPhone 7. Although perhaps their naming department could use a little work, the (mouthful) MDR1ADAC/B Prestige’s are truly revolutionary, even if they are two years old already! What’s so revolutionary you may ask? Well, for example, there has been a lot of hype recently about the Audeze EL-8 Titanium and Sine headphones for their genius idea of incorporating their DAC (digital to analog converter) and an amplifier directly inside the headphone’s cable itself (called the Cypher cable). The Audeze are truly stellar headphones, but unfortunately, Sony beat Audeze to the punch by quite a bit with their MDR1ADAC/B headphones. The true genius in the MDR1ADAC/B headphones is not just that they were ahead of their time, but also in their flexibility. Instead of wiring in a permanent 3.5mm or USB cable, they simply installed female end connector ports and provided a variety of cables you can use depending on the situation. Affordable "all-arounder" option for power listeners? Sony really hit it out of the park with the MDR-1ADAc, not because they are the best sounding cans ever, they’re not, and not because they are crafted with only the finest materials either, because they’re not. But what Sony has done here has made a fair set of cans that can bridge the gap between Apple devices, PCs and desktops. The adaptability of the MDR-1ADAC’s is what makes them true winners for the price conscious audio lover. This means you can connect the MDR1ADAC/B’s via a traditional 3.5mm jack, via a USB connection or via a Lightning connector. Simply unplug and plug in the cable you need for the situation at hand and you’re good to go! This makes the MDR1ADAC/B an absolutely fantastic companion for anyone upgrading to the iPhone 7 because chances are that your laptop, desktop, work computer or some other device you use frequently will still require the ability to connect via an analog 3.5mm jack. There will be other times however when you want to just relax and listen to high fidelity audio directly from your iPhone. By simply swapping out cables, the Sony MDR1ADAC/B perfectly adapts to suit whatever situation you are in, making it the PERFECT transitionary headphone for the new Lightning-only world. >See how the these Sony cans compare to the other lightning cable options from other major headphone manufacturers on our comparison breakdown guide. These bad boys are packed with features that cover all bases, making them perhaps the king of today’s mobile-capable high quality over-ear headphone kingdom. Besides being designed by one of the world’s most reputable digital audio companies and looking badass in black and red, the MDR1ADAC/B’s are packed full of features, so let’s break them down a bit. 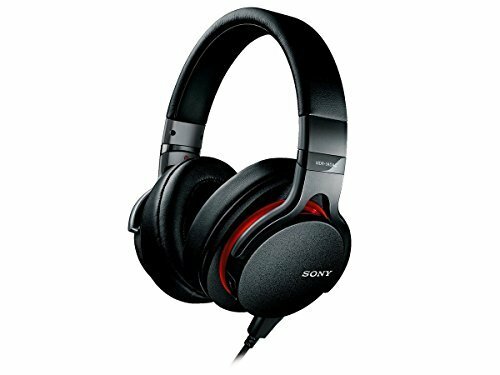 First and foremost, the thing that makes these stand above many other high end headphones, including other models made by Sony are their built-in DAC which stands for Digital-to-Analog-Converter, which takes your crappy MP3 files and smooths them out for a better listening experience. There is also a built in amplifier, powered by a built-in rechargeable lithium ion battery, that takes the weak digital signal from your iPhone for example, and amplifies it, powering the drivers of the headphones to produce a loud and powerful sound, capable of creating impressively deep and rich bass without distorting the mid and high level sounds of your music. Traditionally to get this caliber of sound you needed to lug around two separate metal boxes, a DAC and and Amplifier, to get the most out of your headphones. While this provided decent audio quality, it wasn’t the most “convenient” of setups as you can see in the picture below. Sony is a big manufacturer of quality DAC chips and amplifiers. So it is no surprise then that these headphones contain the latest S-Master HX hi-res digital amplifier Sony is famous for (same used in Sony’s high end Walkmen audio devices) along with a Pulse Code Modulation chip to enable listening up to 192kHz or 24-bit encoding, which is what Lightning can transmit. Sounds is further tuned with the Sony Direct Stream Digital or DSD chip, providing an impressive sound range up to DSD128 support. Sony doesn’t cut any corners with the components used in the headphone/earcups themselves either. Containing large 40mm drivers delivering an ultra wide frequency range of 3Hz to 100kHz (yeah, massive range.. try comparing that to your “Airpods” if you dare!) and a sensitivity of 102dB/mW, which should be plenty loud for the biggest metal/hip-hop/trance fans. Sony also uses a high quality liquid crystal polymer (LCP) diaphragm, which is aluminum coated and combined with a 1.57 inch HD driver to provide massive sound and durability all in one. Combing these high-end hardware components with the high tech digital converter and amplifier and you have one remarkable headset, even if it was only equipped with an old-fashioned analog jack we’d be impressed, but Sony didn’t just stop there..
Sony designed these headphones to be universal as can be. There are three ports on the headphone themselves that allow you to plug and unplug a variety of different connector cables. There is a standard input port, a port to connect micro-USB to charge the headphones independently, and a USB port to connect to any other device like USB or even Lightning via a USB-to-Lightning cable. This means these headphones can connect to your PC, your Macbook, your desktop, your Android phone, your Walkman, your iPhone 5,6 (3.5mm jack) or iPhone 7 (Lightning). Sony supplies all the cables you need to connect to virtually any device with the headphones. This is all truly revolutionary as we are in a time of transition between pure analog, via the headphone jack, to a digital future with Lightning and USB-C ports. Having a headset that you can swap out cables to suit the device you are connecting with is just plain practical. These headphones aren’t a guilty pleasure, they are an investment, an investment that will continue to pay audio dividends well into the future regardless of port standards. Getting a pair of essentially “time-proof” headphones is an awesome thing, especially when you’re dropping down over $200. Finally, although not as exciting as talking about technical specs, we must cover the actual physical design of the MDR1ADAC/B’s. The Coating is textured and black, which give it a rugged look and feel. We believe this is more than just a shiny coat of paint, we believe these are actually rugged and designed to last. Sony has used a metal band in the headband, which music aficionados love because well, plastic headbands inevitably either snap over repeated stretching over heads or lose their ratcheting/adjusting/clicking ability as they wear over time. Metal headbands are much more durable so we’re glad to see them on these cans. Additionally Sony has equipped these badboys with leather ear pads and a leather wrap around the headband to make for a comfortable listening experience even for extended periods of time. Another sweet little touch we just love is the built-in volume adjustment wheel on the earphone cup itself. It’s amazing how Sony so comfortably embraces the future of digital tech by making a headphone that can run via USB-C or Lightning and make use of a built in DAC and amp but they’ve still held onto a bit of “tactile nostalgia” we all love by incorporating a physical rotary style volume controller. We absolutely love this touch. We love that Sony pays homage to the things we can touch and feel and love so much about old analog devices, while still embracing evolution and providing the most up-to-date, high-tech listening experience possible. Not having to pull our huge phones out every time we want to change the volume is also just plain convenient! Overall the MDR1ADAC/B’s are a truly universal, future-proof, high-fidelity headphone that is perfectly suited to bridge the gap between analog 3.5mm jacks and digital USB-C and Lightning ports. In fact, it is one of the only headphones with this capability on the market, and has been since 2014, which means it’s been battle tested and is ready to go. So what are you waiting for? Get yourself a pair and let us know what you think about them in the comments below!